My Musings: A page to indulge my evolving thoughts and feelings. "The Soul of the Rose." This page will be a continually evolving one. It is here that I intend to record my thoughts and feelings about life, the world, and what strikes me as significant as the Muse alights upon me. Unlike the other pages in this site, this one is a personal treasure - where I can share little glimpses of myself, of my heart, my mind, and my soul. 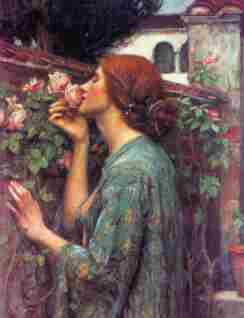 I chose one of Waterhouse's paintings to grace this page, simply because he is one of my favorite painters of all time. The muse definitely infused him. Waterhouse was particularly skilled at painting women - as soft yet strong; deeply feeling creatures kissed with the mystery and delicate beauty of Nature herself. This picture also gets me in the mood for my own first smell of the roses which should bloom within the next month in my garden. I'm not sure if you noticed, but I got into a mad spring cleaning this month. Not of my home, but of DynoWomyn. Although this site is only 17 months old, it goes through periodic changes. This time she had a major overhaul. I hope you enjoy her new look! Speaking of changes, this seems to be a theme in my life right now - and in all those around me. Have you noticed it? This is the era of continual change - all the theories comment on it. The post-modern era will go down in history as an era of continual and major life and world changes. It impresses me how important it is to fortify oneself, yet also to let go and flow with the changes. Right now, we are experiencing a phenomenal planetary configuration, one that is very unusual and rare. Mars, Neptune, Uranus, and Pluto are all retrograde, although Mars will be back in action within the next few days. But the other three - what energies they breed! If you feel like your life is being turned upside down; that your beliefs are changing; your ways of relating to others are going through flux,..you are not alone. These planets, when retrograde urge us to clear away all old and outmoded beliefs, values, and behaviors, and to begin anew. So, don't fret,...flow along with it. You'll feel much happier if you can just groove on each day as it comes, accepting the lessons, and allowing the internal refinement and alignment. Although the world seems to be moving at a much faster pace these days, have you noticed how many people seem to be down, depressed, exhausted? Depression has become one of the top chronic challenges in North America. Even children aren't safe from it. I am happy to see that more and more people are willing to try herbal and natural remedies like St. John's Wort and artistic pursuits, but it still doesn't explain the cause. To me, we live in a special time. A time of great evolution and expanding cosmic awareness. The universe itself is evolving, and each of us within it. With this comes a change in perspective, in worldview. Although positive, it is uncomfortable. It is hard to shed outmoded beliefs, values, nostalgic attachments and dependencies. We are being called to be leaders - all of us! This is hard work, and can lead to depression and other thought and mood disturbances which slows us down and makes the transition less pressing,..more bearable. For awhile. Life seeks to evolve. Period. We can not change this. We can do a good job in resisting it, but sometime, somehow we are all going to do it. This time or next life, it doesn't really matter. But now, in this era that we're currently experiencing, there is a new quickening, an opportunity to grow at a phenomenal rate. If you accept this, and go with the flow, the growing pains are less acute, and you can savor the changes and budding awarenesses. Try not to let it get you down. Keep your head up, and your eyes to the stars and heavens. You will make it. Never worry,... all is proceeding as it should. Today is the New Moon! The perfect time to write down and affirm just exactly what your Intentions for your life are! Try writing down your fondest goals and ambitions. The circumstances, the environment, the personal ambitions that you sincerely would like to manifest in reality. Write them down today (or the day of any New Moon) and focus on them whenever you remember to. Breathe life into them, and visualize yourself experiencing what you have written in a multisensory way. See it, taste it, smell it, touch it, listen to it happening! Firmly affirm the reality of your ambitions, and barring that they harm none, fully expect them to happen in your life. This is a strong and powerful formula, one that you must learn not to be afraid of. It is sad that we as humans almost feel guilty or depraved for really intending to get what is our heart's desire. Most of us are decent people, worthy of goals that are honorable and worthy. No need to be ashamed. Whether you intend to or not, you do draw things to you by way of your expectations and focus. You can drift along on the sea of life, meeting the obstacles and challenges thrown in your path in a willy-nilly way, seemingly at the mercy of life's ups and downs. Or you can navigate those same seas with direction, focus, and a steady hand, and weather the gales to steer clear and straight to the sun-kissed shores beyond. It is your choice. Write it down and make it happen! June 21st First Day of Summer! I did not write this piece below, but it excited me so much that I had to share it! I have long felt an affinity with this Planet we call Earth, our sacred Mother. Now, scientists have found that her inner core is not a raging lava core as we have been led to believe, but a moving, spinning crystal. This opens up a whole new paradigm, in my mind, for viewing this sacred orb we call our Home. I hope you enjoy it as much as I! Seismologists discover that the inner core rotates! Researchers are now probing what may turn out to be the most curious small body the solar system has yet presented for scrutiny: a globe the size of the moon that appears to be a well-ordered crystalline entity. This body is poised little more than 5,000 kilometers away, yet it is completely invisible. Located at the center of the earth, it is known simply as the inner core. Two seismologists have just shown that this strange crystal sphere is turning slowly within the rocky and liquid metal enclosure that keeps it all but hidden from scientific investigation. Geophysicists realized decades ago that a solid inner core exists, but they knew precious little else about it. They believed the inner core and the liquid shell surrounding it were made largely of iron, yet other features of the heart of the planet remained enigmatic. But during the 1980s, seismologists examining earthquake waves that pierce the inner core made a startling find. Rather than being "isotropic" (the same in all directions) in its physical properties, the inner core proved to be somewhat like a piece of wood, with a definite grain running through it. Waves traveling along the planet's north-south axis go 3 to 4 percent faster through the inner core than those that follow paths close to the equatorial plane. Geophysicists have struggled to explain why this grain (or "seismic anisotropy") should exist. The leading theory is that at the immense pressures of the inner core, iron takes on a hexagonal crystal form that has inherently directional physical properties. Some force apparently keeps the hexagonal iron crystals all in close alignment. Lars Stixrude of the Georgia Institute of Technology and Ronald E. Cohen of the Carnegie Institution of Washington note that whatever texturing mechanism operates to form the anisotropic grain of the inner core, it must be almost 100 percent efficient. Otherwise the seismic anisotropy would not be as large as measured. "The very strong texturing indicated by our results suggests the possibility that the inner core is a very large single crystal," they boldly stated in a article published last year in Science. The seemingly absurd notion--that a body the size of the moon could be just one big crystal--is less ridiculous than it sounds. The central core may have grown gradually to its present size as liquid iron at the bottom of the outer core solidified and attached itself to the inner core. That process would occur exceedingly slowly, with few outside disturbances--just like the conditions that favor the growth of large crystals in a lab. Slow solidification of iron might have allowed the inner core to grow quietly for billions of years, becoming in the end a gargantuan single crystal, more than 2,400 kilometers across. But slow crystal growth does not explain the alignment of the inner core's axis of anisotropy with the earth's rotation axis. The process also fails to account for the seismological evidence that the anisotropic grain is not uniform. Xiaodong Song, a seismologist at Columbia University's Lamont- Doherty Earth Observatory, says that the anisotropy at the top of the inner core "is likely to be very weak--less than 1 percent." So it would seem that some other physical mechanism must keep the deeper hexagonal iron crystals in line. Although several explanations have been proposed, the most reasonable theory calls on internal stress (generated by the earth's rotation), which is strongest along the north-south axis. Thus, the hexagonal iron that constitutes the inner core could crystallize (or recrystallize) in parallel with the spin axis--as do the mica flakes that form in rocks squeezed by tectonic forces. Internal stress could thus keep the inner core's grain well aligned with the spin axis--perhaps too well aligned. It turns out that the grain of the inner core is not exactly parallel to the earth's rotation axis: in 1994 Wei-jia Su and Adam M. Dziewonski of Harvard University reported that the axis of anisotropy is in fact tilted by about 10 degrees. At about the same time, Gary A. Glatzmaier of Los Alamos National Laboratory and Paul H. Roberts of the University of California at Los Angeles were working on a computer simulation of how the earth's magnetic field operates. Although the tumultuous churning of the outer core's liquid iron creates this magnetic field, Glatzmaier and Roberts found that the influence of the solid inner core was needed for proper stability. Their modeling also indicated that the inner core may be shifting slowly eastward with respect to the earth's surface, impelled by persistent fluid motions at the base of the outer core. Reading that result and realizing that the seismic grain of the inner core was not wholly aligned with the spin axis, Song and his colleague Paul G. Richards decided to look for seismic evidence that the canted grain of the inner core was indeed swiveling around relative to the rest of the earth. Their idea was to examine seismic recordings of waves that traveled through the inner core decades ago and to compare them with more recent signals. If the core rotates, the time it takes these waves to traverse the inner core should change systematically. The challenge was to find recordings of seismic waves that passed close to the north-south axis and to devise a way to compare them precisely enough to detect the slight differences that result from less than 30 years of change (the span of seismic records). But they solved both problems and found evidence of rotation quite quickly. "Everything happened in three weeks," Richards notes. The team started by looking at seismic traces recorded in Antarctica caused by nuclear tests made at Novaya Zemlya in the Soviet Arctic. Traveling from one pole to another, these seismic waves penetrated the core. Examining data that had been collected over the course of a decade, Song and Richards observed what appeared to be a change of two tenths of a second in the travel time of the waves that passed through the inner core as compared with those that just skirted it. They then scrutinized a set of seismic recordings made in Alaska of earthquakes that occurred between the tip of South America and Antarctica and found similar results to confirm that the inner core was in fact moving. They presented their discovery in the July 18 issue of Nature. Although the detection of inner core movement was itself a remarkable experimental achievement, the correspondence in direction and speed of this motion (eastward at a degree or two a year) with the predictions of Glatzmaier and Roberts was more remarkable still. But geophysicists are far from having figured out the workings of the inner core. No one yet understands for sure what causes its anisotropic grain. Nor can scientists explain why the anisotropy should be tilted. According to Glatzmaier, "It's anybody's guess at this point." A group of devotees invited a master of meditation to the house of one of them, to give them instruction. He told them that they must strive to acquire freedom from strong reactions to the events of daily life, an attitude of habitual reverence, and the regular practice of a method of meditation which he explained in detail. The object was to realize one divine life pervading all things. "In the end you must come to this realization not only in the meditation period, but in daily life. The whole process is like filling a sieve with water." The little group saw him off and then one of them turned to the others, fuming, "That's as good as telling us that we'll never be able to do it. Filling a sieve with water, I ask you! That's what happens now,isn't it? At least with me. I go hear a sermon, or i pray, or i read one of the holy books, or i help the neighbors with their children and offer the merit to God, or something like that and i feel uplifted. My character does improve for a bit -- i don't get so impatient, and i don't gossip so much. But it soon drops off, and i'm just like i was before. It's like water in a sieve, alright. But now he's telling us this is all we shall ever be able to do." They pondered on the image of the sieve without getting any solution which satisfied them all. Some thought he was telling them that people like themselves in the world could expect only a temporary upliftment; some thought he was just laughing at them. Others thought he might be referring to something in the classics which he had expected them to know -- they looked for references to a sieve, without success. In the end, the whole thing dropped away from them all except for one woman, who decided to see the master. He gave her a sieve and a cup and they went to the nearby seashore, where they stood on a rock with the waves breaking around them. "Show me how you fill the sieve with water", he said. She bent down, held the sieve in one hand, and scooped the water into it with the cup. It barely appeared at the bottom of the sieve and then was gone. "It's just like that with spiritual practice, too", he said, "while one stands on the rock of I-ness, and tries to ladle the divine realization into it. That's not the way to fill a sieve with water, or the self with divine life". He took the sieve from her hand, and threw it far out into the sea, where it floated momentarily and then sank. "Now it's full of water, and it will remain so", he said. "That's the way to fill it with water, and it's the way to do spiritual practice. It's not ladling little cupfuls of divine life into the individuality, but throwing the individuality far out into the sea of divine life." "...So long as the people do not care to exercise their freedom, those who wish to tyrannize will do so; for the tyrants are active and ardent, and will devote themselves in the name of any number of gods, religious and otherwise, to put shackles upon sleeping (wo)men." Today is the New Moon,...do you have your Intentions set? (see June 13th entry, above). This is the perfect time to affirm what you Intend to Manifest in your Life, write it down, and focus! Another planetary configuration will impact on all your plans right now too. Mercury goes retrograde today until August 5th. Mercury joins Uranus, Neptune, and Pluto who have all been retrograde for the past few months. What does this mean? It means, make your life as simple as possible. If you have to work and meet deadlines, give yourself the largest time margin possible! Give yourself plenty of time to do everything! Especially activities related to communication, computers, machines, letters, payments - anything where you rely on electronic and personal communication. Give yourself space in relationships too! Don't make any rash decisions now, it is hard to see the whole picture; and everyone is having trouble communicating what they REALLY feel. This is likely due to the fact that unless you have plenty of time for reflection, YOU probably don't know how you feel. Oh, you feel the frustration, the restrictions, and the restless urge to break out of any confining variables and situations. But take it slow, you may make decisions that you regret later. If possible, stay calm and focused; and allow others their space. This is a great time for working on yourself - your inner world, your thought patterns and your repressed memories. Cleanse yourself, rejuvenate, and rise anew like the phoenix from the ashes. I loved this little story, and wanted to share it. To me, it exemplifies the principal of compassion and giving, a principle that can work magic in our lives. I'm not suggesting that you as a woman stop on a dark lonely highway - there are safety issues, obviously. But giving spontaneously can have profound effects on both you and the receiver of your generosity. Gives us something to ponder. Late one night, very near midnight, an older African-American woman was standing on the side of an Alabama highway trying to endure a lashing rain storm. Her car had broken down and she desperately needed a ride. Soaked to the bone by the storm, she decided to flag down the next car. A young white man stopped to help her - generally unheard of in the conflict-filled 1960's. The man took her to saftey, helped her get assistance and put her in a taxi to make her appointment. She seemed to be in an awful hurry! She quickly scrawled his address on a soggy piece of paper, thanked him, then rode away into the darkness. The following week, an unexpected knock came at the same young man's door. When he opened the door he found a delivery truck in his driveway unloading a brand new, giant combination color TV and stereo record player! A note was attached. Thank you so much for assisting me on the highway the other night. The rain drenched not only my clothes, but my spirits. Then you came along. Because of you, I was able to make it to my dying husband's bedside just before he passed away. God Bless you for helping me and unselfishly serving others. This site is now 17 months old, and for the most part, has been mostly informative, and hopefully, inspirational. Now, I would very much like it to become an interactive site. In that vein, I have just created the DynoWomyn Community, which you can join by clicking HERE! This community is intended to offer you a space to share and dialogue with like minded women in a private environment about your experiences, your dreams, your concerns, and your insights. There is both a chatroom and discussion board space for either private or public interaction. There is also space to post pictures and graphics; to list your favorite (and your own) websites; to announce events geared towards women; and to place classified ads. I hope that you will find this community useful, and will participate. Women have so much wisdom within them. When combined with that of others, phenomenal growth and power can be realized. Please come and share yourself with us! Autumn Equinox begins in Eastern Hemisphere; September 23rd in Western. It has been a long time since I've had a few minutes to indulge myself in my musings. Hustle and bustle have been my flavor of life lately. However, tomorrow is a day of celebration: The Autumn Equinox,..time to take a few minutes out to reflect. And indeed this is the season of reflection. Busy, harvest time as well, but it is a gathering of soul and spirit that signifies the most important task of this Equinox - to me, anyway. If you can, take time to sit with your journal, your paint brush, - whatever your favorite mode of expression is: and dedicate the day to finishing up the "old" in your life, and welcoming in the new. "See" yourself harvesting all the good things that your hard work, intention, and desires are drawing to you, and letting the tired old ways and burdens slip away. Gird yourself with strength, renewed vigor, and sparkling dreams to usher in the time of Thanksgiving, of Forgiveness, and of Mature Inner Knowing. Dance the waltz of true abundance as you take stock of all your rich Blessings, your inner Well of Wisdom, and your mantle of Grace and Strength. I wonder if you are experiencing the same sort of challenges as I am in personal relationships. I am finding it interesting to take a "watcher" approach to life, and observe myself interacting with those who are close to me. Lately, the "kinship waters" have been mightily charged with conflict, head butting, and a screaming desire for change. Can you relate? The solution to being sucked into a never ending cycle, for me anyway, has been to stand back as I just mentioned, and really try to see the issues, the dynamics, and the interplays from a third party perspective. This strategy is more for my peace of mind than anything else. Building one's central core is the next step in being able to withstand the energy assaults and curb negative emotions. If one can see the relationships in one's life as "mirrors" - pictures of inner doubts and conflicts, a sense of clearing can unfold. You may have outgrown your current alliances, or you may just be going through a period of adjustment together. Which ever it is, try to always maintain your balance and sense of self worth. If these relationships are not sustained, others will come. Try not to let them destroy your own balance. You deserve happy, invigorating and supportive relationships. If you do not have them now, focus on this outcome, and they will come in time.